In this episode, the Legendary Warriors barter their heroics for food... with a tribe that considers any Legendary Warriors evil. Now that all the character sheets have been filled out, it's time to start the campaign properly. True to form, that means checking the jobs board at the tavern to see what quests are available. In doing so, they find two additional wrinkles in this whole Legendary Warrior business and meet their first recurring villain. The circumstances behind Grumblemon's introduction and the immediate danger he poses should make this one riveting. The problem is, well, that he's Grumblemon. Say what you will about Devimon being bland, but at least there was no doubting that he was the villain to beat in his arc. Grumblemon has none of the features that would suggest that he's a significant bad guy to be feared and respected. He's a stubby little gremlin of a monster with a silly nose and a speech impediment. A good villain either dominates the scene from the beginning or stays in the shadows until the right moment. Grumblemon does neither: he's clearly a bad guy, but it takes forever for anyone to realize that he's a bad guy to be taken seriously, even while he's pummeling Agunimon. It would be a stretch to call him a worse enemy than Etemon, but it is fair to say Etemon's introduction was more impressive. His presence does introduce two significant pieces to the plot- evil Legendary Warriors and the Beast Spirits. The former is a nice wrinkle that fits in nicely with the series mythology. After being told there were ten Legendary Warriors, the obvious question should be what's going on with the other five. Presenting them as villainous agents of Cherubimon gives us five bad guys to deal with. Don't let Grumblemon ruin the concept; some of them are pretty good and one of them establishes the season's primary drama. The coolest part of this is that by having them come from the same stock as our heroes, it reinforces that Cherubimon used to be in step with Ophanimon and Seraphimon until their rift. During the battle, Grumblemon uses his Beast Spirit, providing an important teaser on the next stage of evolution. 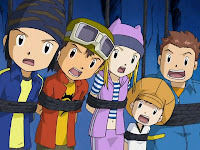 We're just getting used to these kids turning into Digimon, and the thought of further evolutionary stages probably hasn't entered our heads yet, but with only ten spirits, there would appear to be an impediment to going Ultimate. While not an Ultimate level per se, the answer lies in Beast Spirits. Grumblemon alone wasn't anything the combined forces of the digidestined couldn't handle (eventually), but Gigasmon wastes them. The show seems to try showing off slide evolution, the art of rapidly going back and forth between the two to gain some sort of advantage, but Grumblemon does it so often and with such little impact that it just looks annoying. This quest is also where Koji joins the party on a more permanent basis, but not by choice. He certainly wasn't thrilled to see the gang again (and may or may not have bashed Takuya in the head upon seeing him). He's apparently been doing fine on his own, and almost saved the KaratsukiNumemon dames himself, later escaping the rope-happy menfolk in dazzling fashion. The rest of the team clearly does hold him back here, particularly Agunimon's insistence on engaging Grumblemon directly... something Grumblemon has no interest in. In fact, this is a rare example where the not-Takuyas are more effective than Takuya as Beetlemon lands the hardest blow on Grumblemon and Kumamon and Kazemon actually get around to freeing the prisoners. As for the KaratsukiNumemon, they really should know better than to string up their saviors, especially under the false logic that a bad guy would give a damn about his allies. 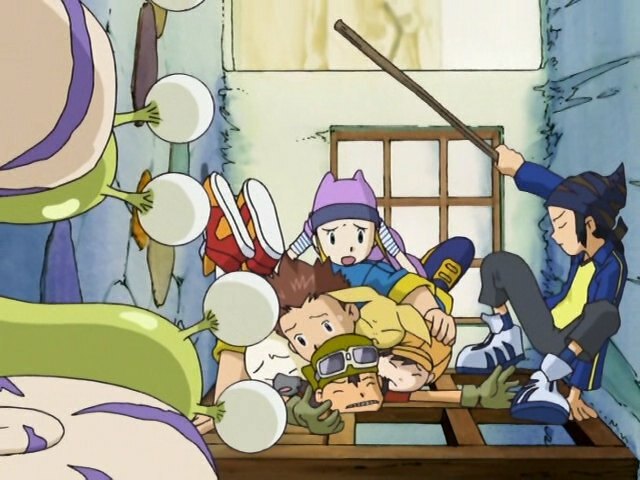 This episode goes a long way in invalidating the notion that Bokomon serves any useful purpose. It's shocking that he, who seems to be as adjusted and civilized a Digimon as Digimon get, is completely broke in a world that clearly has some sort of currency-based economy going on. Furthermore, he had no idea there was such a thing as bad Legendary Warriors, demonstrating his inability to solve such complicated algebra as 5+x=10. Never mind how the kids survived the loops on the Trailmon track in a rickety cart... how the hell did the Trailmon survive it without crashing into himself? Along with Koji smacking Takuya, Zoe's slapping JP looked a lot more painful in the Japanese version. Zoe has this remarkable knack for clobbering JP and Takuya under the false pretense that they're sexually harassing her... but letting it slide when they actually are sexually harassing her. Incidentally, by all logic and for more reasons I can count, Zoe should have gone up the ladder before JP. If she falls, she spirit evolves and flies to safety. If he goes up first and falls, they're both dead. 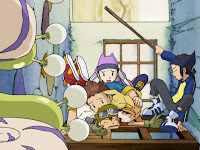 The concept of the sideways house is clever (and comically impractical for the digidestined), but why do the KaratsukiNumemon have human-sized beds? This is the first episode where the good guys achieve the minor goal of saving the locals while the bad guy achieves the major goal of ravaging their homeland into nothingness. Better start getting used to it! I thought Zoe wanted to go after JP because she didn't want him to see up her skirt. I could be wrong about that. Not sure whether or not she wanted to, but she interpreted his "ladies first" gesture as a move to get a looksie and slapped him accordingly. He was just trying to be polite, and as I said it would have been the more logical order anyway, other than the potential for perving. In the original she was definitely mentioning the looking up her skirt part... maybe this is some sort of disney censoring. You could ask why she didn't change into her beast spirit perhaps. She didn't have her beast spirit at the time. And no, there's no censoring, she did point out that she was wearing a skirt in the English version too. 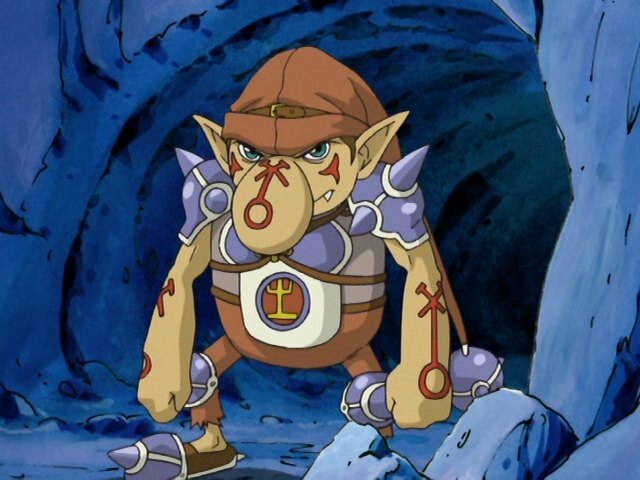 Bokomon doesn't really strike me as the kind of Mon with any useful skills outside of being a supposed know it all. And Neemon probably messed up all his job interviews. What I'd like to know is why on earth was Koji scaling that mountain in the first place. Seriously, the episode just opens to him inching along this ridiculously narrow ledge with absolutely no explanation for how did he end up there or why did he think it'd be a good idea to potentially risk his life climbing up this one mountain with no footpaths along it. -Being the only girl, it's obvious someone will want to peep at her undies. Grumblemon having Digitamemon's voice is a bit off-putting, not gonna lie. Oddly enough, I was pretty fond of Grumblemon. He may be an ugly little gremlin with a speech impediment but he was a truck! Not Big Bad material, but a nasty jerkass able to throw the heroes around like rag dolls. Plus I love the hammer. I'm not sure JP going after Zoe is the more logical approach. Both of them have Spirits that can fly. But I really like the Analysis, thank you for that!